Chicken coop bedding (or ‘litter’) is placed on the bottom of your chicken coop and nesting boxes. There are many different bedding material options, all with their own pros and cons. There is no right or wrong choice. Consider which suits you and your chickens best. Whichever bedding material you choose, it will need to be changed regularly. You know it needs changing whenever it starts to smell bad. Spot cleaning or scooping out small messes daily can increase the time between entire coop clean outs. Why Use Bedding for Your Chickens? Bedding collects and absorbs chicken poo. Note that chickens do not urinate! Absorbent bedding will help your chicken coop to stay cleaner and smell better for longer. Keeps your chickens healthy as they will not be exposed to damp conditions and ammonia. Bedding provides a soft surface for your chickens to walk on and promotes foot pad health. Bedding catches the eggs and prevents them from being damaged by impact with the coop floor. Hemp is a form of animal bedding that is booming in popularity. 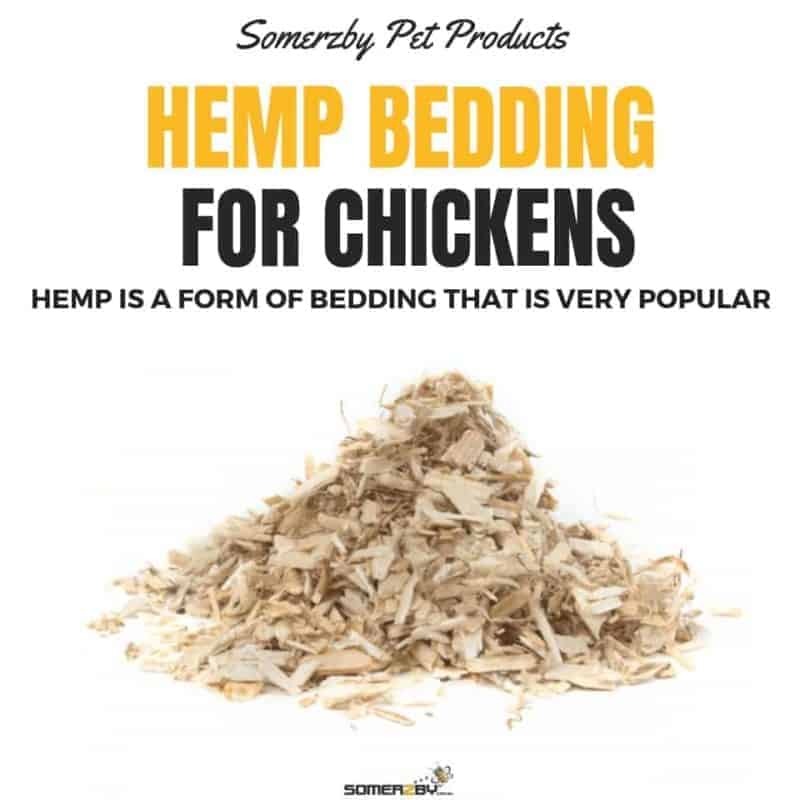 Hemp bedding is made from the woody stalk or ‘hurd’ of the cannabis plant. It is a sustainable resource and an eco-friendly product. It is biodegradable and naturally breaks down, meaning it can easily be composted. It is commonly grown without pesticides or insecticides so there is no chemical residue passed on to your chickens. Hemp bedding is much more absorbent than other types of bedding material. This means your girls won’t be sitting in the damp and you won’t have to change their bedding nearly as often. It’s high absorbency also means it helps to control bad odours in your coop. It will absorb ammonia efficiently. This can assist with preventing skin infections and improving your chickens’ overall health. Hemp bedding is also dust-free. This eliminates respiratory issues as well as nasal and eye infections caused by dusty bedding. Hemp is a natural pesticide that can help repel flies and other bugs. It also has anti-bacterial properties, to help keep your chickens healthy. It has good insulation and will keep your girls comfortable and warm. The downside to hemp bedding is that it is more expensive. However, because you need to change it less often, it can work out to be a reasonable cost in the long run. Wood shavings are a very popular form of bedding material. They are super absorbent and smell great. Wood shavings are readily available in most pet stores and are not too expensive. Pine shavings are the best option as they smell good and cause no issues for chickens. Some argue cedar shavings can cause health issues in chickens so best to steer clear. Sawdust can also work however it is very dusty. This dust can cause respiratory problems for your girls plus irritate their eyes. Wood chips are not absorbent enough to be used within the coop. However, they can be used in your run if you require a bedding material which will help drain water away (rather than absorb it). If you have a very muddy run, use wood chips to help fix it. Shredded paper, newspaper or cardboard are a great way to save money and reuse paper you would have thrown away otherwise. They are also dust free so they won’t risk irritating your chickens’ respiratory systems. They aren’t as absorbent as other types of bedding so they may need to be changed more often. They can also become slippery. This creates a risk of young chicks slipping and dislocating their legs. Avoid using glossy paper such as old magazines as they are less absorbent and more likely to cause your chickens to slip. Straw is a very cheap form of bedding. It is low in dust so won’t irritate your chickens’ health as much as other forms of bedding material. Straw is absorbent but not as absorbent as other types of bedding. Straw is perfect to use for nesting boxes. It can be more difficult to shovel out than other bedding. Hay is not fully dried out, like straw, so it can easily get too damp and form mould. It will therefore need to be changed more often. Hay can be quite expensive. This entry was posted in Chickens and tagged bedding, chicken, Chicken Coop, hemp, paper, straw, wood shavings.